Phoenix Petroleum Philippines recently signed a five-year supply agreement with Anflo Management and Investment Corporation (ANFLOCOR) to supply fuel to its agricultural and trucking businesses. Under the contract, Phoenix will supply diesel, gasoline, and Jet A-1 fuels to four of ANFLOCOR’s affiliate companies: Tagum Agricultural Development Company, Inc. (TADECO), Davao Packaging Corporation (DAPACOR), Panabo Trucking Services, Inc. (PTSI), and Davao Agritech Inc. (DAAI). 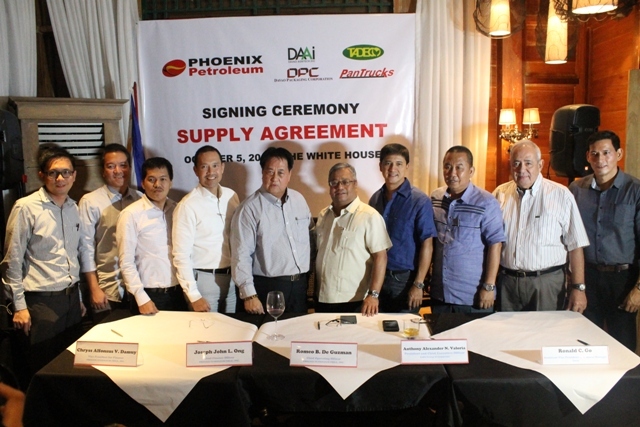 Present during the signing on October 5, 2016 at The White House, Davao City were (from left) ANFLOCOR AVP for Purchasing Richard Go, AVP for Studies Group Dante Arevalo, Phoenix VP for Finance Chryss Alfonsus Damuy, Chief Finance Officer Joseph John Ong, Chief Operating Officer Romeo de Guzman, ANFLOCOR President and CEO Alexander Valoria, SVP and COO for Banana Operations Vincent Floirendo, SVP and General Manager for Industrial Companies Jesse Chiongson, Board of Director Anthony Sasin, and Davao Agritech AVP and General Manager Capt. Ronald Go. The Anflo Management and Investment Corporation (ANFLOCOR) manages and oversees businesses in various industries like agriculture, real estate, merchandising, and trucking that make up the ANFLOCOR Group of Companies. Phoenix Petroleum is the leading and fastest growing oil company today with an expanding network of operations nationwide. It has almost 500 retail stations nationwide and supplies fuel to commercial and industrial companies in industries such as agriculture, power, construction, transportation, and mining.